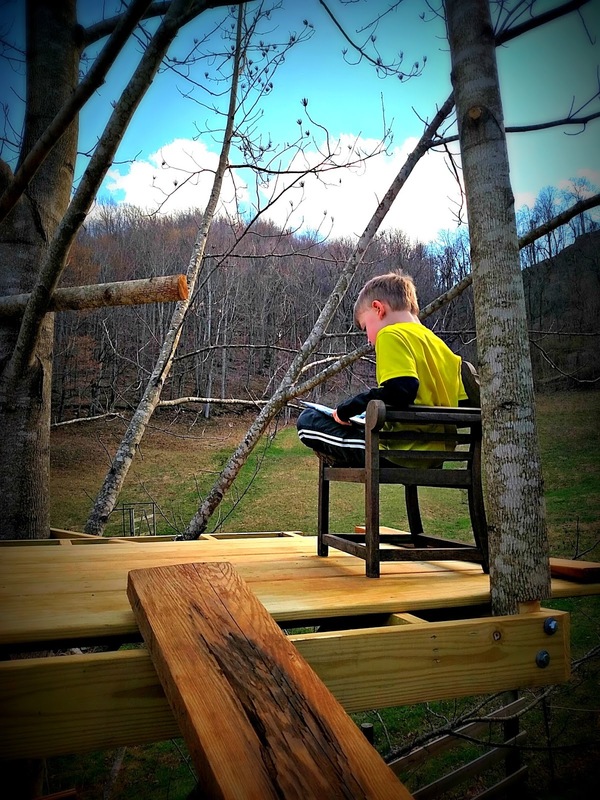 Reid decided to put his Christmas money from this year towards building a treehouse. It's still very much a project in progress. But on nice days, he loves to go do his reading homework up in the branches. It does seem like a relaxing spot to read, doesn't it? I'll feel better once the railings are up though! I would worry too about those railings not being up as well! I love tree houses! How far up is this one? That is cool that he's part of the building process. A tree house, what a brilliant idea! It does look like a wonderful place to sit and dream of wondrous things. Kids love this, don't they?! Good Morning, Lisa. I love the tree house and Reid looks happy up there reading. Even at my age, I would love to have a house in the trees like the ones I see on home and garden tv! And what a great view! Who needs walls? I love it. It looks like a great new perspective for play time. Sounds exciting to have a tree house. A good hide out for the young man! That's cool he set his money aside for that. How neat. I know what you mean by the railings being up. That is so cool! I would loved something like that at his age. How exciting! Can't wait to see the finished product. Enjoy! Aloha. You're right, Lisa. That's really a very nice spot! He'll always remember it too. Fun! My brother and his friends made a fort in the backyard when we were kids. They gave me the bottom level because all of the nails from the upper level were sticking through the ceiling. Nice, eh? Beautiful shot! Love the warm light and bright colors.